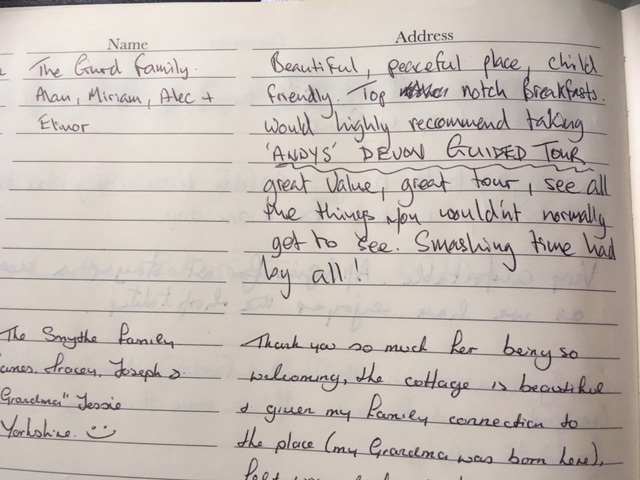 Testimonials: Below are a number of comments left by our guests. Barn: nice place by the steam, the yurt delightful when it's sunny and lovely little cat. Lorna. A memorable jubilee day in the South Devon. Enjoyed the beach at Broadsade, Paignton and the Jubilee celebrations at Dartmouth. Thank you for the comfortable room and the lovely breakfast. 27th August Helen and Kieran S. Bristol. Stayed in the Yurt. What a lovely place to stay with lovely hosts. Jenny made us feel really really welcome home from home. What really surprised us was how easy everything is to get to. Jenny has contact with a really reasonable taxi firm and the regular bus is just 5 minutes away. It too us 1 hour to Dawlish using public transport. What a fantastic few days, we only wish we could have stay longer. We will certainly be back though. Thanks Jenny. Lovely to be in such a beautiful Yurt fantastic atmosphere and tranquil surroundings. Thank you for the perfect getaway. Lovely peaceful spot, kind and hospitality comfortable little apartment lovely garden. We had a lovely stay in the yurt, beautiful surroundings and a great breakfast. Great hospitality, really enjoyed our week away. Lovely setting and very warm welcome thank you. Its great to be back again, thank you for the hospitality. B & P R. Potters Bar Herts. 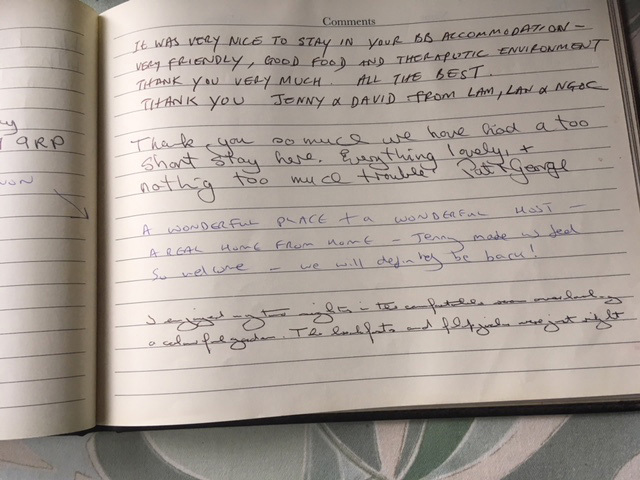 We have had a lovely time, a lovely place to stay and we think Jennie is probably the nicest person we have ever met would love to live here forever such a lovely quiet place, our little dog loved it here too. Pete and Sue West - Ringwood. Delightful Wonderful after driving down in torrential rain a warm and homely welcome was much needed. 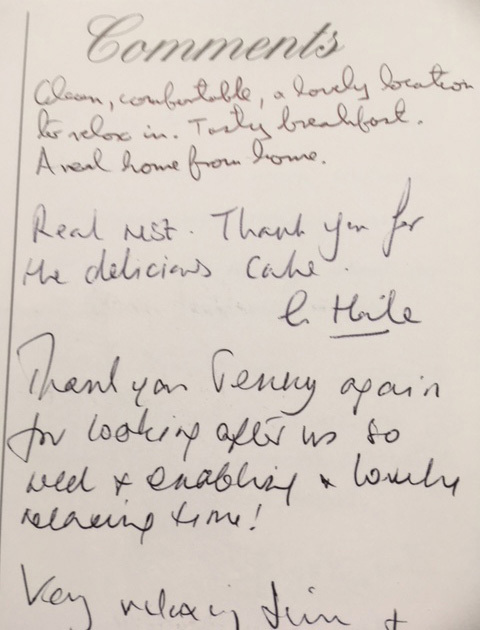 Especially those little thoughtful touches - fresh flowers an Easter egg and fruit cake to die for, yummy. Kathryn and Ian Bognor Regis. It was so lovely to wake up to the sound of the bird song and then really enjoy a hearty English Breakfast. In spite of rainy weather we had a cosy warm retreat in your house with good breakfast to start off the days in a positive way. Thank you for the warm hospitality. Lovely house lovely location very good for our dog and very good breakfast for us. Relaxing holiday in a lovely setting. Thank you for letting us come and go as we please, we have thoroughly enjoyed it. Fantastic beautiful location, great food and hospitality lovely garden and great place to stay with the dog. Lovely bedsit style room, peaceful and quiet with a feeling of being a family guest. Ground coffee a nice touch. Had a glorious week great breakfast thank you Blessings and Light! A very restful stay, have enjoyed it greatly. The view of the garden with the apple blossom is lovely and of course the stream. Thank you Jennie Hope to be back some day. The best night's sleep I've had in years! So pleased to have stayed in such a beautiful spot with the stream. Thank you for your warm welcome and hospitality. Will try a duck egg next time! Thank you Jenny, for your warm welcome and hospitality. What a great nights' sleep. Bless you. A gorgeous, idyllic place - thank you for such a lovely stay - and nice and warm, too. What makes this place so special is Jennie! 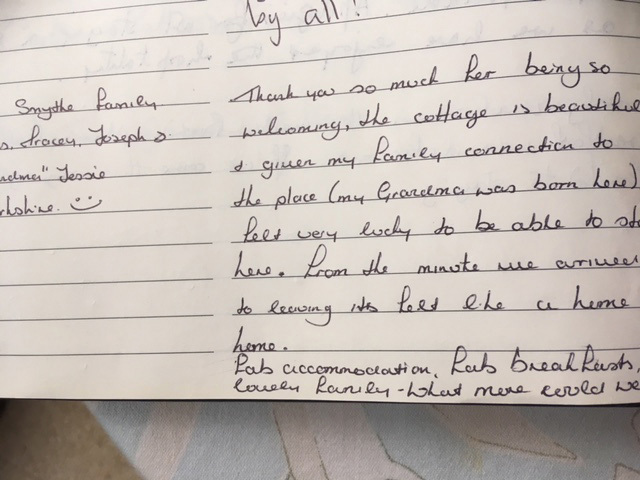 A lovely, kind host who makes you feel at home! 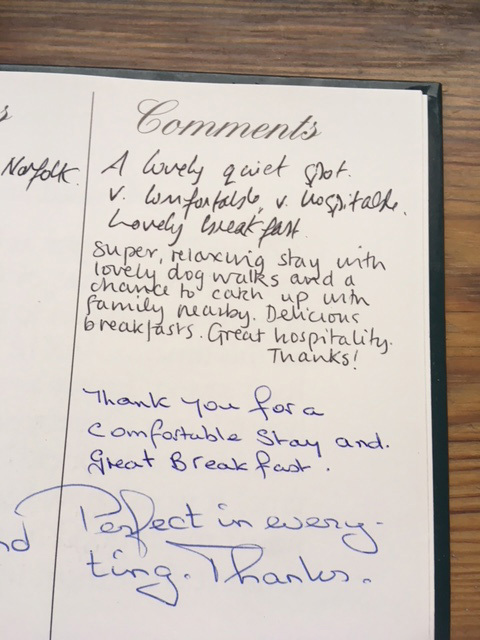 A peaceful stay with scrumptious breakfasts (delicious sausages) Thank you. 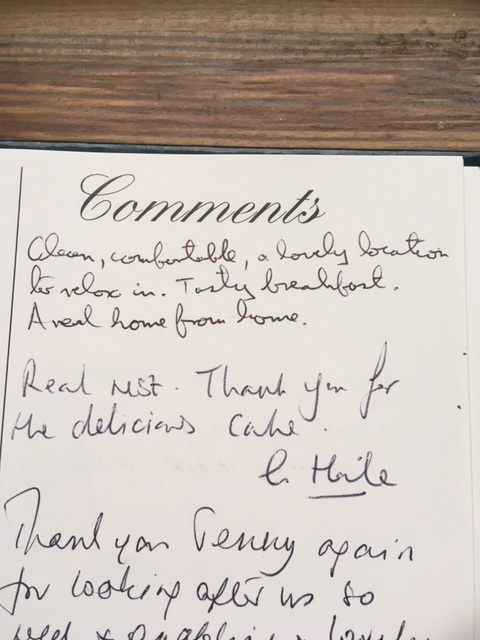 Lovely welcome from Jennie and Sons and a very peaceful house with tranquil garden. Thank you for such a wonderful couple of days. Very homely and welcoming will recommend. A beautiful resting place with a very warm welcome Thank you. 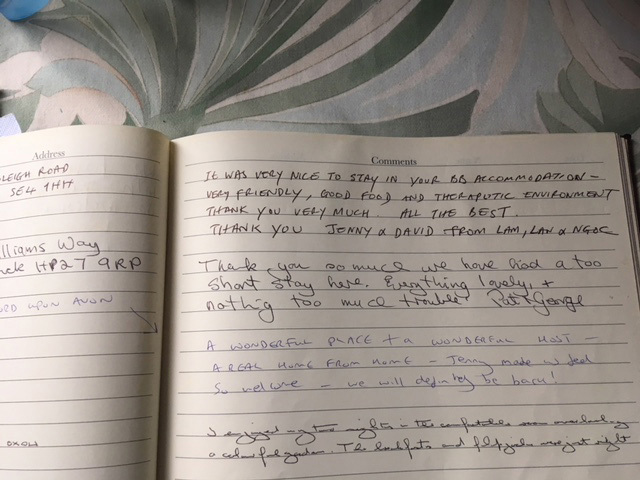 Jenny, thank you for the warm welcome and letting us stay in your lovely home. The setting is perfect. 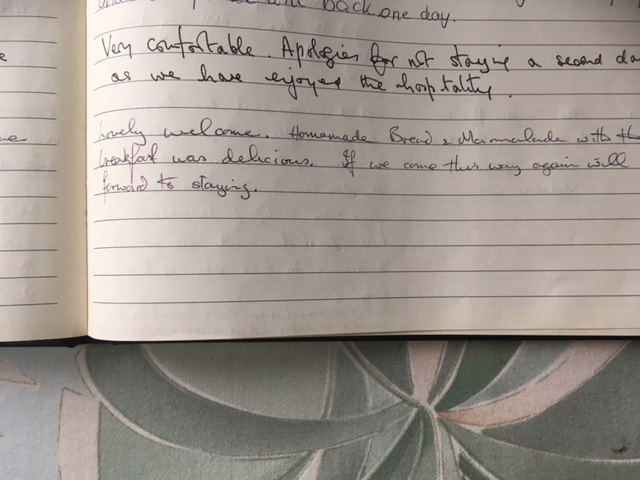 We had a nice stay again like two years ago. We only seem to come here when it rains, but then things brighten up again. Thank you for having us back. Wonderful location, peaceful nights sleep and a great breakfast! What more could you ask for? Fantastic! Two lovely rooms and a wonderful garden. Will definitely come here again. I thought the house and bedrooms were excellent but the bridges and woodland walk-way was the best by far, it gave me a sense of adventure. 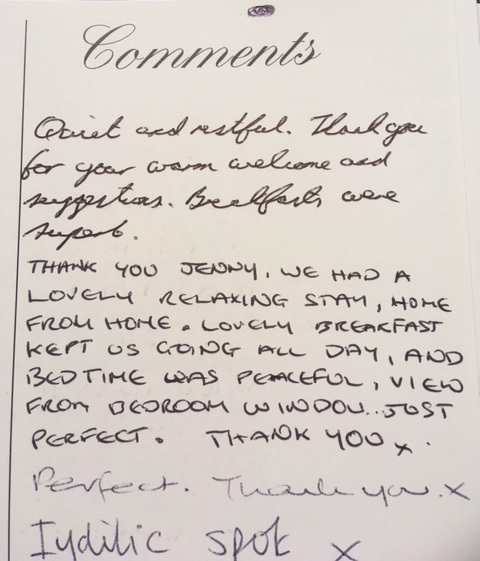 Thank you, Jenny, for a wonderful relaxing stay, you couldnt have been kinder or done more for us, a real home from home. A unique camping experience / highly recommended. Really romantic - we loved it and well be back again - thank you for your hospitality. Beautiful house, beautiful location - fantastic and very trusting host. Thank you for a wonderful couple of days. We will most certainly see you again. What a secluded little haven! Waking to the sound of song birds and a bubbling brook. Great hospitality, some lovely touches and a terrific breakfast. Will come again! Lovely break. Super hospitality too, great food and weather! Thanks, Jenny, we needed this. A spontaneous escape to Devon and Lower Cobberton was just what we needed - the boys loved the garden and we all enjoyed a feast of a breakfast. 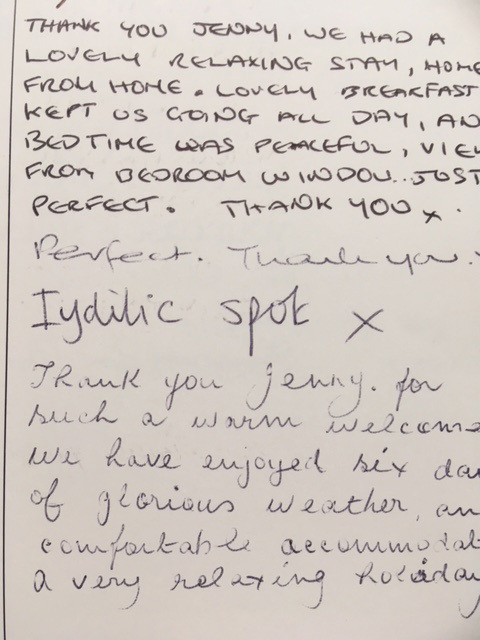 A very restful stay and a very friendly welcome, an excellent breakfast and a wonderful Christmas dinner! Many thanks. Very welcoming, comfortable and warm. 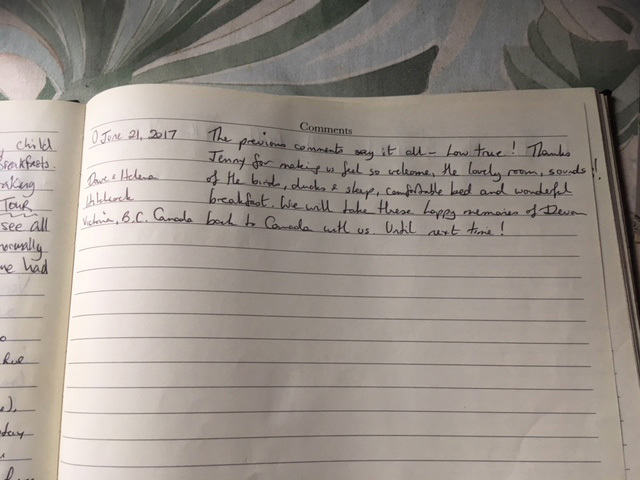 Thank you so much for a lovely stay. 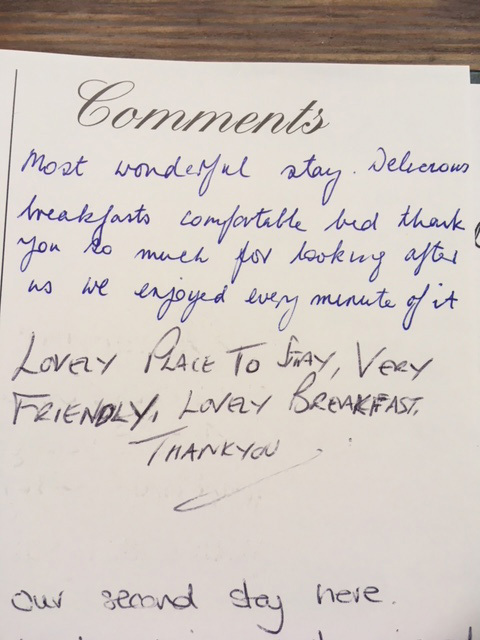 Thank you for your warm welcome, lovely breakfast and great facilities, ideal place to stay in Dartington. Thank you very much - weve had a very comfortable week. Very peaceful location. Hope to come again. We love this place! Thank you for everything!! !